Okay, so obviously there isn’t actually a new pope. That was a stupid joke combining my name with “hope.” This article has nothing to do with the Catholic Church, its leadership or any allegories written by Oxford dons lambasting its values and practices (Although did you hear they’re making a miniseries of the “His Dark Materials” trilogy? Isn’t that wildly exciting? No? Just me? Okay). So here’s what this post is actually about: Living in New York City—the City That Never Apples, The Big Sleep—has given me a different perspective on life at Dartmouth. Now that I am “beyond the bubble,” things up at school just don’t seem quite as, well, important. First off, I’m going to skip over the existential and truly depressing crisis of homelessness in this city. Everywhere I’ve lived before now, the sight of a homeless person in the street would be cause for shock, alarm, calling the authorities and taking immediate action. Here, people step over bodies to get to work, ignore the destitute when they appear and, truth be told, I’m now doing it, too. You can’t give everyone money, so how do you decide who to give to? It’s a moral quandary without any particular answer and with no easy egress. It’s also a good reminder of how truly powerful each of us can be: A $10 bill is little enough when you have food, safe water and a roof over your head, but for someone without any of that, it can be a massive salve. The only answer is to either ignore all homeless people or to be arbitrary in our charity, and I have selected the latter, although this technique ultimately highlights the disparity more by making me more aware of my own whims. Last week, I handed a man some money as he was begging on the subway platform. I realized later that the only thing that made him different from the man begging the night before was that I was in a good mood (I had just come back from a lovely evening out and was feeling very happy). Why should my emotions dictate any part of his life? Anyway, I promised to skip over this, and now I’m ranting. It is simply hard for a kid from the great northern woods to embrace the concept of homelessness in this sense. Maybe we just never see it in Vermont or Massachusetts, maybe New York is just worse at hiding its sins, but so it goes. My real point here is that, in the grand scheme of things, even the most important things we do at Dartmouth are trivial. 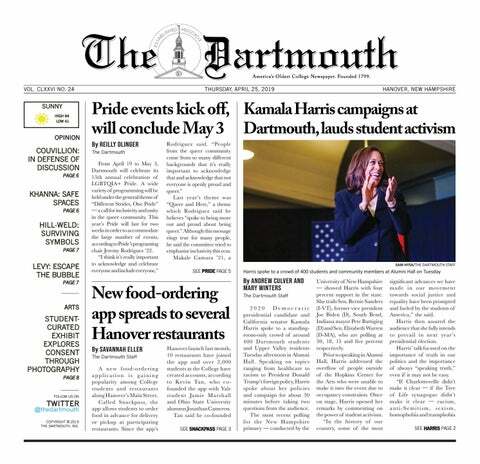 What really matters to Dartmouth students — searching for jobs or keeping up with classes — seems so minor outside the bubble. From the outside looking in, I see ultimately how incredibly blessed we are to attend one of the greatest academic institutions on the planet, a school so storied and often revered that it ranks among the best-known and most respected of all the thousands of colleges and universities across the globe. Few, if any, Dartmouth students will be without some form of gainful employment, even if they end up working at the local bank rather than the dream job at Morgan Stanley, or editing novels rather than writing them. My point is that we are all doing okay, and we are all going to be okay. And we are so scarcely aware of this at Dartmouth. The kid sat next to you in class may have a 4.0 GPA. He may be graduating summa in the spring, he may have just landed a Marshall Scholarship and he may be headed to a dream job at the State Department, but that doesn’t matter. What matters is trying to do what you love, what matters to you. Since I’ve been in NYC, I’ve tried to cut down on planning everything in life (Seriously, I have many spreadsheets of course plans, laid out with different abroad and off terms and different majors and minors, all piled high in distant folders on my laptop). Instead, I’ve decided to think about classes and jobs in a more straightforward way. I simply ask myself, Will I enjoy this course and what will I gain from it? No more taking classes because they’ll help boost my GPA, or because they’ll make me more likely to land some specific job in exactly 8.73 years time. Instead of making decisions based on some abstract concept of employability or some bogus belief that financial success equates to happiness, I am choosing classes and applying for internships based on whether or not they will help me grow as a person. And it took being away from Dartmouth to help remind me of that.